Full Zip Lined Navy Raincoat with 1 Internal and 3 Outer Pockets. Welcome. Would you like a Pringle of Scotland Exclusively for Alpen Fleece. 24" pit-to-pit, 28" length, XL It's in decent pre-owned condition. If so press Buy it Now and it's yours. It can be on its way to you today from Ashford, Kent in the UK. Total Length: 68 cm = 26.8 in. The top half has an extra lining made of polyester, acrylic, cotton and wool. See photo. The jacket has 2 side pockets and one inside pocket. The waist is elasticated on both sides which is very handy, and the cuffs are fastened by 2 adjustable buttons. Made in Italy. Contrasting colour sides and sleeve back. James Pringle XXL Mens Fleece Coat in Navy. Really warm material and very soft. Brand new with tags. Purchased for £60. Available in navy blue, this lightweight Pringle jacket features a zip up front, a funnel neckline with button detail, and has two external button up pockets for storing your wallet and other essentials. E xcellent golf jacket in a graphite colored blend of nylon and polyester. with storm flap that is secured with velcro tabs. Two side front pockets. with contrasting light grey fleece inner collar. james Pringle navy hooded wateproof jacket. Bought new just before winter, hardly used it, in perfect hardly worn condition. Has a hood which helps when it's windy and raining, the lining up s a grey cloth material. All in all a nice coat for a bargain price! PRINGLE OF SCOTLAND. PREMIUM QUALITY FROM THE WORLD FAMOUS PRINGLE OF SCOTLAND LUXURIOUSLY SOFT - 52% SILK SHELL. BLAZER JACKET. BUTTON UP FRONT ONE CHEST POCKET TWO POCKETS TO FRONT FULLY LINED - 78% COTTON. But in excellent condition with zip front fastening and two front pockets. Immaculate used condition, no tears, wear or stains. Great 80's pattern lining, padded for extra warmth. Features three outside pockets plus one inner. Pit to pit: 27". Pringle of Scotland Men's Lambs leather Jacket Mainline Collection. 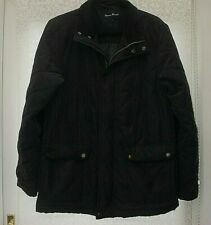 A vintage men’s Pringle Sports Jacket Coat Size Large with an Approx 50” chest. It’s probably more of an autumn winter jacket as it’s thicker than a lightweight spring jacket. It’s in good clean condition from a pet and smoke free home. | Size from label: XL. 4/6 - good condition. may have little spots of dirt, small holes itp. 5 /6 - near perfect condition - barely visible signs of used. PRINGLE WAISTCOAT. Material: 100% POLYAMIDE. We use grading scale from7 (excellent/as new) to1 (poor). PRINGLE WAISTCOAT. We use grading scale from7 (excellent/as new) to1 (poor). Condition in out of 7 scale:6. always ready to discuss and find a way of any unexpected issues. That's why it's SO IMPORTANT.